Bo Toys Push & Go Friction Construction Vehicle Set offers an array of exciting and educational friction-motor powered construction toy cars for hours of delightful playtime. *1pc Dump truck (3.6” x 2.6” x 2.8” inches), rotating car bucket can unload the building materials . *1pc Bulldozer (8.3” x 2.6” x 3.2” inches), the arm of the bulldozer can move up and down, each joint can move independently. *1pc Tractor with a detachable trailer (6.5” x 2.6” x 2.8” inches ), Fun cartoon driver will amuse your baby, the carriage can be jointed to the main body to carry small items, and the rear door can be opened or closed exercising the flexibility of baby’s hands. *1pc Cement mixer(3.6” x 2.6” x 2.8” inches ), The mixer can rotate up and down and discharge the cement, letting kids know the principle of mechanical automation, cultivating their creativity and manipulative ability. Made of high quality, sturdy plastic. Long lasting friction power.Best Early Educational Toys. 4-WD system: all trucks runs on push-and-go power. Just hold the truck, push it forward several times, then let go and watch it roll. THE PERFECT GIFT: Great for boys and girls, toddlers and small kids will loves this toy, making it a great birthday or Christmas present, school reward or behavior prize. “No Questions asked ” return / replace 100% satisfaction guarantee.CONSTRUCTION VEHICLE SET Of 4: The Engineering vehicle set includes 1 tractor excavator, 1 bulldozer, 1 dump truck and 1 cement mixer. Improve kids learning interest and curiosity. 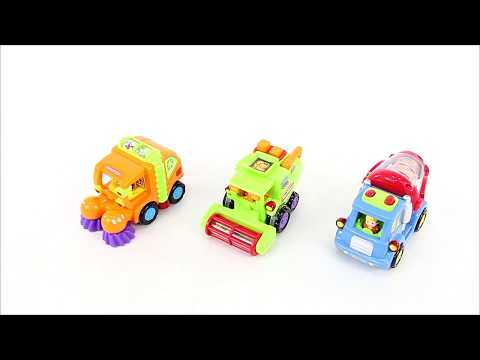 Push and go toys helps kids learn different colors, vehicles shapes and functions. Stimulate their creativity. KIDS DEVELOPMENT: The toy cars and trucks promote the development of your child’s mini motor skills, hands-eyes coordination and allow for imagination cultivating open-ended play. DURABLE and SAFE DESIGN: Made of durable, shatterproof ABS plastic to ensure long lasting performance. Non-toxic ABS plastic construction with soft edges for safe handling. UNLIMITED FUN : Without Supervision. Kids can do it all by themselves ! Much better than the old style where you had to pull back to wind them. Durable and sturdy enough that children can play the vehicles freely withstand the tossing, even throw toys on the tile floor that won’t gonna break apart or stop working. No Batteries Required: friction powered with moving mechanisms are super easy to power with no loud noise. Colorful sturdy trucks were a great hit and completely new to your kid’s truck collection. Good size and easy for small hands to grip.